Prior to the opening ceremony, orientation program for the new academic session was arranged for the staff members on 27/28 February, 2013, so that staff members get prepared for the new session and get going well. 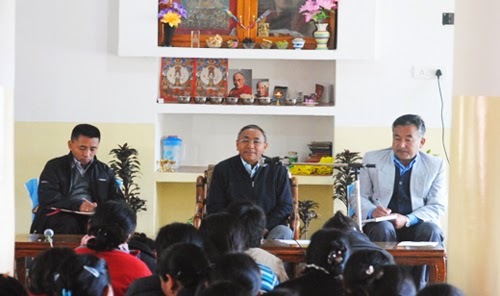 On the first day of orientation program, the school arranged a talk by Geshe Lhakdor la, the Director of Tibetan Library and Archives (CTA). His main focus of talk was on corporal punishment, its weaknesses and disastrous consequences on the mental development of children. He further elaborated his talk by giving example of shaping child’s behavior since the child is being conceived in the mother’s womb. During the pregnancy, the mother has to remain cool and should stay in the state of happiness prior to child birth. He said, “Don’t expect thank you from others for your work done”. Your work for others should be considered as a natural state of affairs. Furthermore, he laid emphasis on four qualities of a teacher; ༼མཁོ་བརསྦྱིན་པ།༽ ༼སྙན་པར་སྨྲ་བ།༽ དོན་སྤྱོད་པ།༽ དང་། དོན་མཐུན་པ།༽ On the second day (28th February) of orientation program, Mr. Kunphen Sherling one of the senior most and retired staff of TCV was invited as the guest of honor to share his long experiences being in the Tibetan Children’s Village. In the afternoon session, the principal of the school made clarification and known to the staff members regarding Default cases, Pension scheme, Warning card system and avail of Casual and other leaves.